X Il apparaît dans les étendues d’eau au crépuscule. Si son front brille, il se sert de sa télékinésie. X Aparece en ríos al anochecer. Puede usar poderes telequinéticos si su frente brilla misteriosamente. X Appare presso i corsi d’acqua col buio. Acquisisce poteri telecinetici se la sua fronte diventa incandescente. X 해 질 무렵 강가에 모습을 나타낸다. 이마가 이상하게 빛날 때 신통력을 발휘한다고 전해진다. Y Ses pattes arrière palmées font de ce Pokémon un excellent nageur. On peut souvent le voir nager élégamment dans les lacs. Y Las patas traseras palmípedas le permiten nadar. Es común verlo chapotear con estilo en lagos y otras zonas acuáticas. Y Le zampe anteriori palmate ne fanno un elegante nuotatore, che si può incontrare nei laghi e in altri specchi d’acqua. Y 손바닥이 물갈퀴로 되어 있어 헤엄을 잘 친다. 호수 등에서 우아한 모습을 볼 수 있다. Omega Ruby Golduck is the fastest swimmer among all Pokémon. It swims effortlessly, even in a rough, stormy sea. It sometimes rescues people from wrecked ships floundering in high seas. Omega Ruby Entoron ist der schnellste Schwimmer von allen Pokémon. Es schwimmt mit Leichtigkeit auch durch eine raue, stürmische See. Manchmal rettet es Menschen, die in Seenot geraten sind und auf dem Meer treiben. Omega Ruby Akwakwak est le Pokémon qui nage le plus vite. Il nage sans se fatiguer, même lorsque la mer est agitée. Il sauve parfois des gens coincés dans les navires bloqués en haute mer. Omega Ruby Golduck es el nadador más rápido de los Pokémon. Además, nada sin esfuerzo hasta en aguas turbulentas en plena tormenta. En ocasiones, ha rescatado a náufragos en alta mar. Omega Ruby Golduck è il più veloce nuotatore tra tutti i Pokémon. Nuota senza fatica anche nel mare agitato e tempestoso. Talvolta salva naufraghi dai relitti affondati in alto mare. Omega Ruby 헤엄치는 스피드는 포켓몬 중 제일이다. 태풍으로 거칠어진 바다라도 문제없다. 난파선에서 사람을 구해내는 일도 있다. 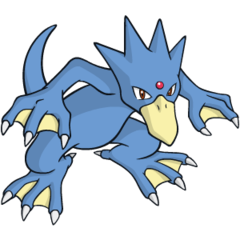 Alpha Sapphire The webbed flippers on its forelegs and hind legs and the streamlined body of Golduck give it frightening speed. This Pokémon is definitely much faster than even the most athletic swimmer. Alpha Sapphire Die mit Schwimmhäuten überzogenen Flossen an seinen Vorder- und Hinterbeinen und der stromlinienförmige Körper machen Entoron unheimlich schnell. Dieses Pokémon ist auf jeden Fall schneller als die meisten Hochleistungsschwimmer. Alpha Sapphire Les pattes avant et arrière palmées et le corps aérodynamique d’Akwakwak lui donnent une vitesse effrayante. Ce Pokémon est bien plus rapide que les plus grands champions de natation. Alpha Sapphire Golduck alcanza una velocidad de vértigo gracias a las aletas palmípedas de las extremidades y a la forma aerodinámica de su cuerpo. Realmente, la velocidad de este Pokémon supera la de cualquier nadador. Alpha Sapphire Le zampe anteriori e posteriori a pinna dotate di membrana interdigitale e il corpo longilineo di Golduck gli conferiscono una velocità incredibile. Infatti è molto più veloce dei più esperti nuotatori umani. Alpha Sapphire 손발의 물갈퀴와 유선형의 몸이 수중에서 무서울 만큼 빠른 스피드를 낸다. 금메달리스트보다 단연 빠르다. Blue Often seen swimming elegantly by lake shores. It is often mistaken for the Japanese monster, Kappa. Stadium Its webbed hands and feet make it a proficient swimmer. May be seen swimming elegantly at dusk in places like lakes. Stadium2 When it swims at full speed using its long, webbed limbs, its forehead somehow begins to glow. 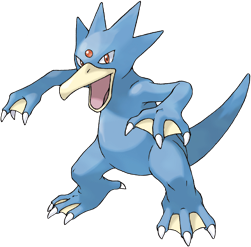 Ruby The webbed flippers on its forelegs and hind legs and the streamlined body of Golduck give it frightening speed. This Pokemon is definitely much faster than even the most athletic swimmer. Sapphire GOLDUCK is the fastest swimmer among all POKeMON. It swims effortlessly, even in a rough, stormy sea. It sometimes rescues people from wrecked ships floundering in high seas. Diamond A Pokémon that lives in lakes. It swims faster than any human swimming champion. Pearl The flippers of its well-developed limbs give it shocking speed. It is the best swimmer among Pokémon. White It is seen swimming dynamically and elegantly using its well-developed limbs and flippers. White 2 When its forehead shines mysteriously, Golduck can use the full extent of its power.